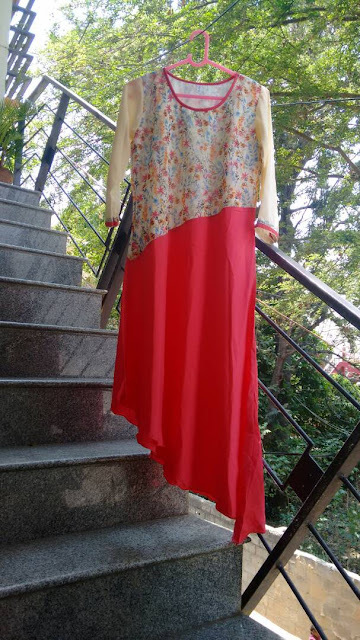 kurtis are great for just about any season but they work just amazingly in summers. 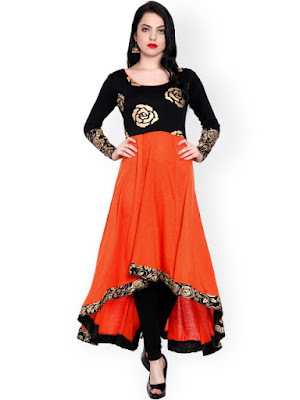 This comfortable piece of ethnic wear is getting more trendy with uneven hemlines. Curved, flared and asymmetrical hemlines give kurtis a very fun vibe and I cant seem to get enough of these. I was window shopping at myntra 3 weeks back and added all these kurtis to my wishlist. A week back I finally added some of these styles to my closet and I cant wait to flaunt them . I am going to start off with my favourite asymmetrical hemline kurti at present. 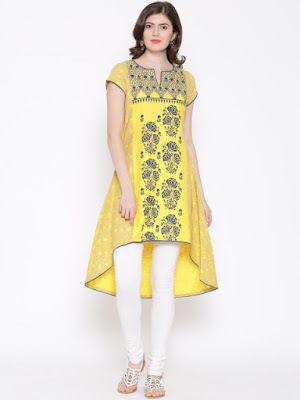 This kurti from Aks is all things gorgeous and it looks even better in reality. The colour is the sweetest coral, the cloth is soft crepe and the floral top half only adds to its beauty. I purchased this kurti and my sister loved it a lot so she also went on to buy one for herself! Now we both have same kurti style in same color, lol. Such a gorgeous mix of colours making it perfect for summer and the cloth is pure cotton too. I brought this too and Iam very impressed witn the quality and designing of BIBA, will shop more from them soon. 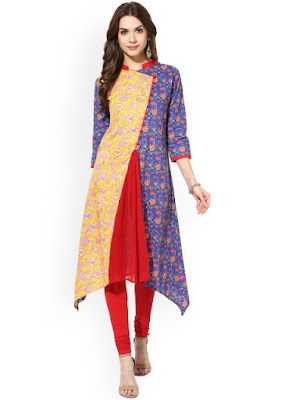 This kurti looks good with leggings but Iam looking to pair it with a pair of palazzo pants, what say? Layered and asymmetric , can it get anymore better? Ira soleil has some fabulous designs but I kind of have issues with the fit becuase they are made of viscose or rayon but this kurti is just adorable and so festive. I ca wear to a wedding , or maybe a mehndi or eid? Another colourful kurta from biba which is currently hanging in my closet. I love the mix of vibrant colours in this but the cloth and collar neck isnt very summer friendly but who cares, Iam gonna wear it indoors with AC on . The flare also is just very little and the kurti looks more Aline than asymmetric when worn so if you are starting off with uneven hemlines this is a good pick. I find styling this kurti very tricky, the white legging looks very bland may be jeans would work better. This cotton kurti in light colors looks perfect for summers and the tasseled hemline gives it a fun vibe. 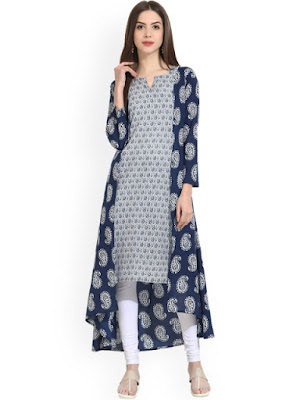 I love how this kurti is paired with relaxed lace bottoms but I think i would pair it with leggings. Basic, comfortable and chic. 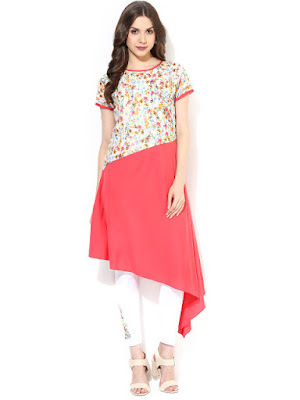 This Ives kurta is perfect for everyday errands, pair with leggings, jeans or even palazzos. 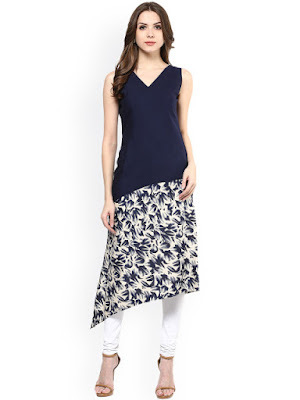 Navy kurti in traditional prints with a contemporary hemline, whats not to love? Aks is like my current favourite brand for kurtis, they have such interesting colours, prints and cuts. I will be putting together a list of my favorites from this brand soon. 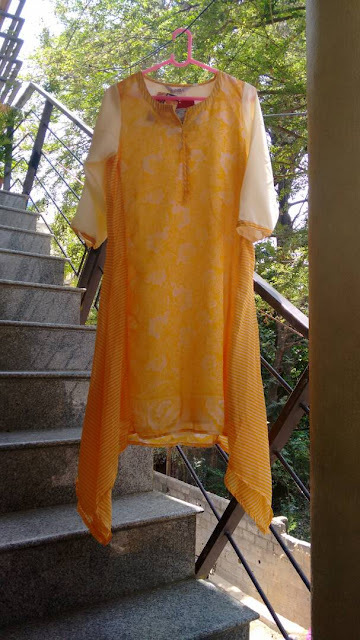 This particular kurti not only has a hatke hemline but also a very interesting neck design. 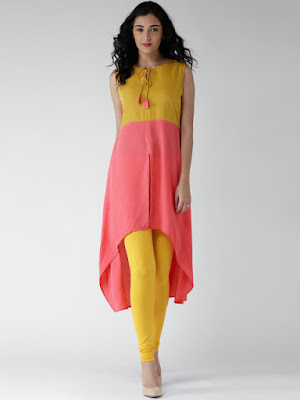 How fun and summery are the colours in this kurta? 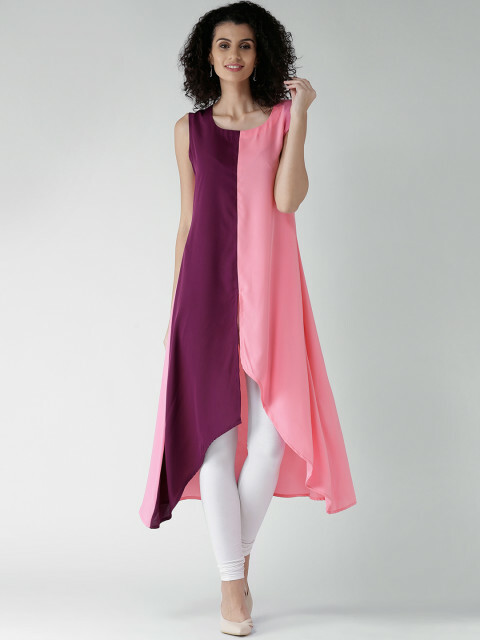 The candy colours are pefetc for day time wear and the slit in the front adds an interesting dimension to this style. 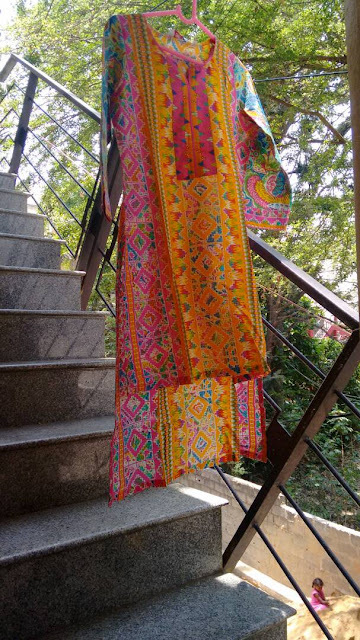 This printed kurti from rangriti is light and summery. I love anarkali kurtis with a smaller flare for everyday wear and this with its slight high low detailing is perfect. A more contemporary take on kurtis, thisoff white kurti from Imara is all things quirky. Pair it palazzos, leggings, jeans or just wear it without bottoms like a dress. Love. Rain and Rainbow always have athe most comfortable cotton kurtis and this yellow kurta looks cute and classy. 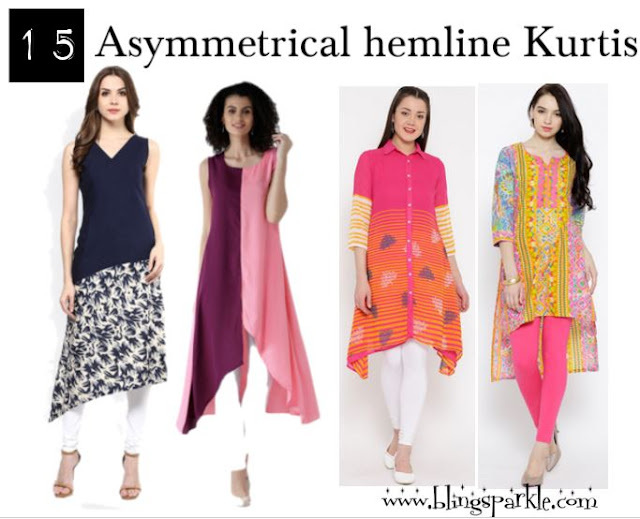 I have noticed with asymmetric hemlines you can skip the dupatta or stoles effortlessly. Ira soleil has some very funky deign kurtas but they mostly make viscose kurtas which Iam not very comfortable with. 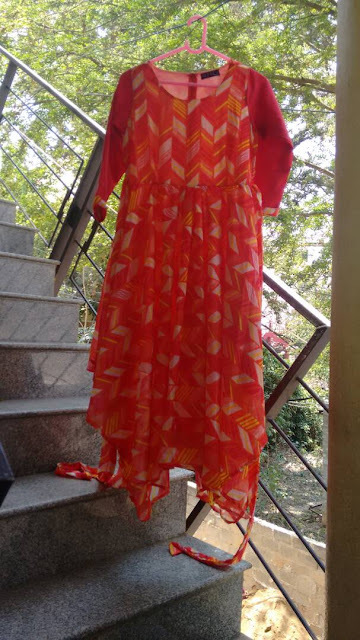 If you like viscose or Rayon kurtas try this ornage high low kurta from Ira soleil . How absolutely refreshing is this colour blocked kurta? Iam so lusting over it and will surely buy it on sale tonight . Do you have any asymmetrical hemlines in your wardrobe? Flipkart is having this big 10 sale from midnight today and myntra will sure join it. Hope to score a discount and add some more asymmetric to my wardrobe. Which is your favourite kurta from this list? Woud you buy something from this list? Tell us!